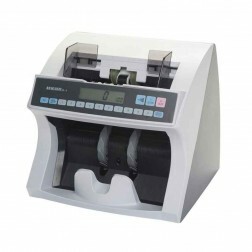 With an extensive variety of elements and alternatives, the Magner cash currency counter and detector is intended for precise rapid handling, effortlessness of operation, and tough unwavering quality, even in the most requesting applications. Browse an essential model with variable grouping or a more propelled model with double head, double edge attractive suspect counterfeit detection. They also offer bright and attractive suspect counterfeit identification. Read More Quick, easy money numbering starts the moment they're turned on. The Magner Cash money counter is the world's most minimized coin discriminator with a devoted reject pocket. It is furnished with the most far reaching, easy to understand capacities fundamental for tellers and clerks in any money taking care of environment.